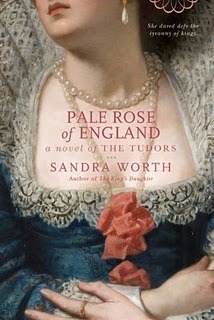 This week's teaser is from the deliciously readable and super fabulous Pale Rose of England by Sandra Worth. Even though I know nothing about this era, Worth's writing is so engaging and her characters so human, I'm sucked in. This week's teaser is from early in the novel, when a sick Catherine is sent to sanctuary for safety. The prior was a figure of misery as he stood rubbing the edge of his crucifix between his fingers. He was thinking of the beautiful young woman in the tawny sea gown who had stood before him little more than a week earlier, her babe asleep in his nurse's arms, her handsome husband at her side. They had come with such high hopes, such noble designs for the kingdom, and now here they were, their doom fast approaching. Though he was a man of faith who would never question God's plan, sometimes the uncertainty of human destiny and its tragic consequences brought him to the edge of grief. I really like that Victorian-esque cover. Beautiful. My Teaser is a little different and based on author Olivia Cunning who is over at my blog today giving away free books. Nice teaser. I might have to add this one to my wish list. All - I'm posting my review on Thursday -- this is the kind of historical novel that makes me love the genre. It's so good! I am glad this book is good! I LOVE Richard III, and I am looking forward to the chance to read this one when I have some time :-) And money. Nice teaser! I've read mixed reviews about this and I'm looking forward for your review. Thank you for a wonderful teaser. The cover alone is enough to tempt one to get this book. Thank you for coming over to my blog. I am also now a subscriber to yours. This book sounds great - especially after your recommendation. Now I must get it. All -- just posted my review -- I loved this book -- such a moving, engrossing telling of this woman's life -- well written and engaging!